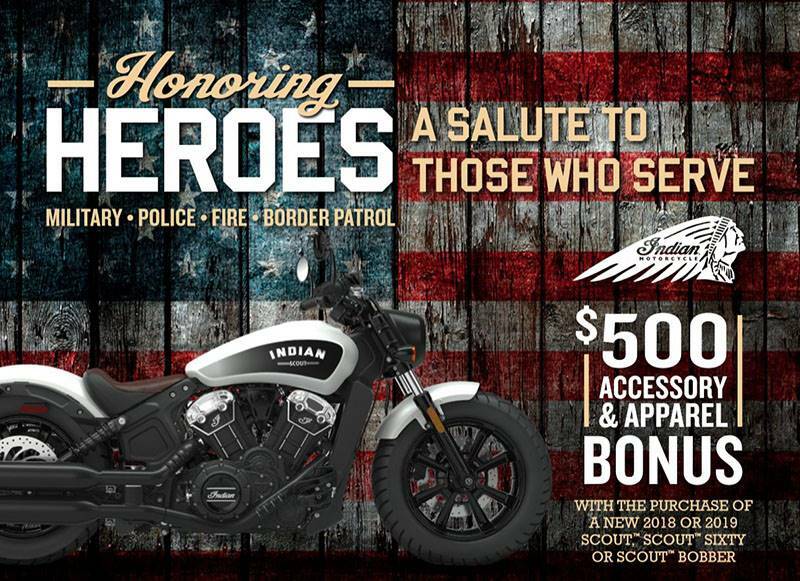 $500 OFF TO THOSE WHO ARE SERVING OR HAVE SERVED IN OUR MILITARY, AS WELL AS OUR POLICE AND FIRE DEPARTMENT. 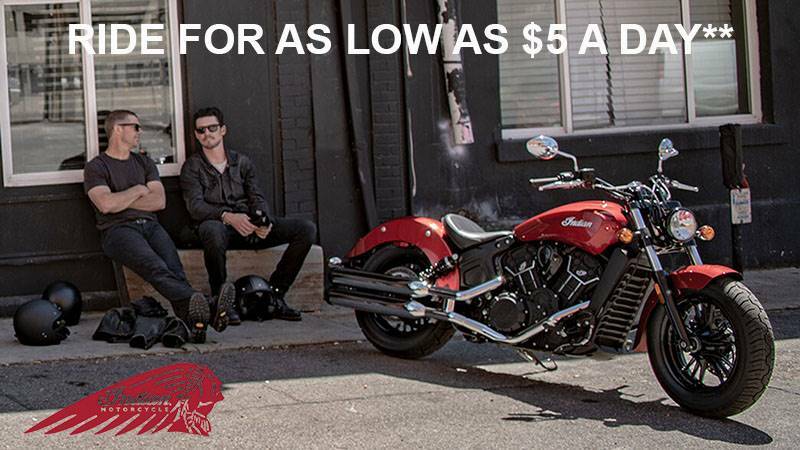 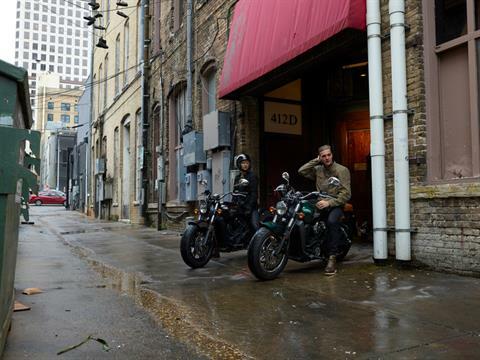 WE WANT TO THANK YOU IN HONORING YOU A $500 DISCOUNT ON ANY MIDSIZE INDIAN MOTORCYCLE. FLEET-SIDED FENDERS: The Scout features fleet-sided fenders inspired by the original Scout. 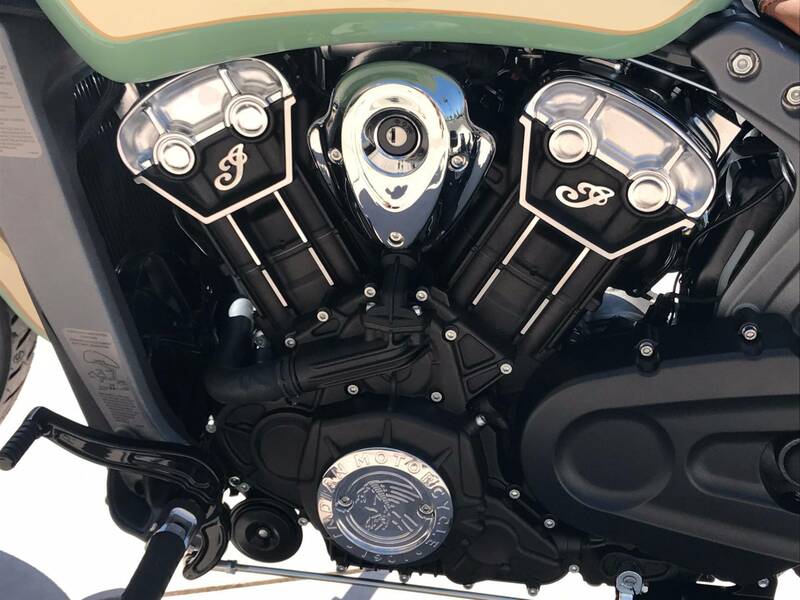 69 CUBIC INCH V-TWIN ENGINE: The 100 horsepower V-Twin delivers innovative styling, a soul-stirring exhaust note and amazing throttle response. 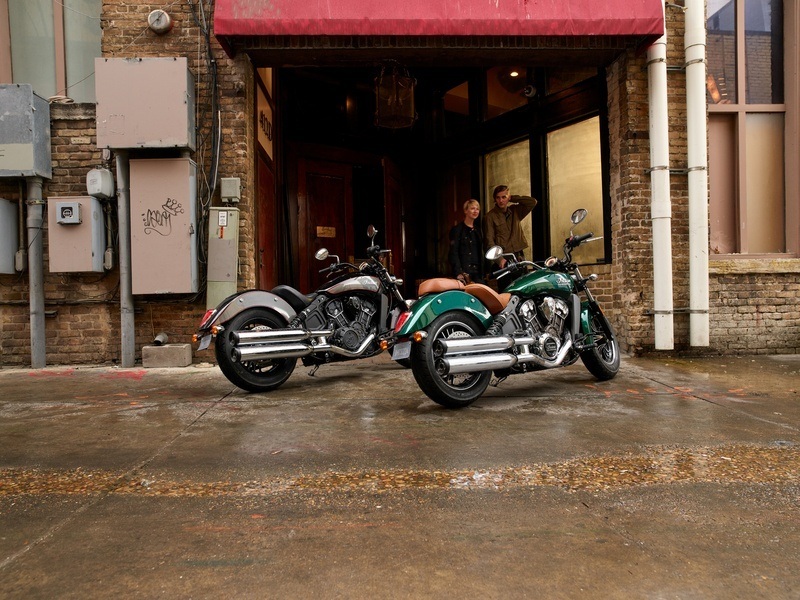 With reliable, efficient liquid cooling that provides outstanding performance in all riding conditions. 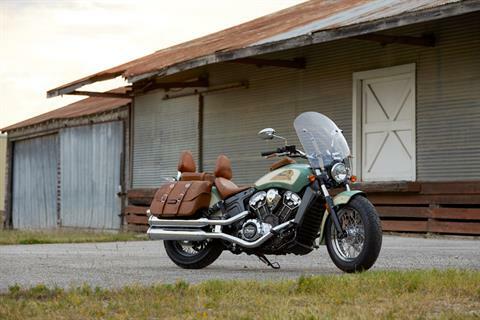 CAST ALUMINUM FRAME: This cast aluminum frame was inspired by the geometry of the original 1920s Scout. 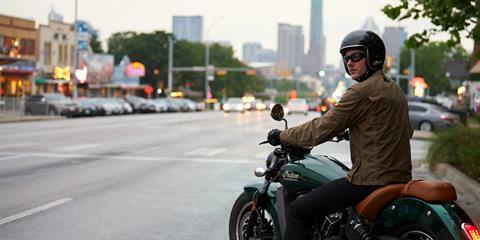 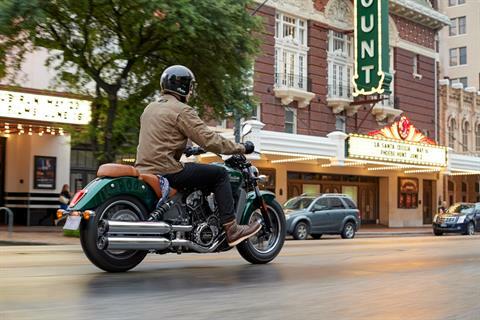 LIGHTWEIGHT CHASSIS: With its lightweight chassis, the Scout delivers sporty, responsive handling. A low center of gravity and a solid-mounted engine provides smooth, predictable handling at all speeds. HERITAGE-INSPIRED HEADLIGHT DESIGN: Today's Scout remains true to its rich legacy by featuring a headlight design inspired by the original. 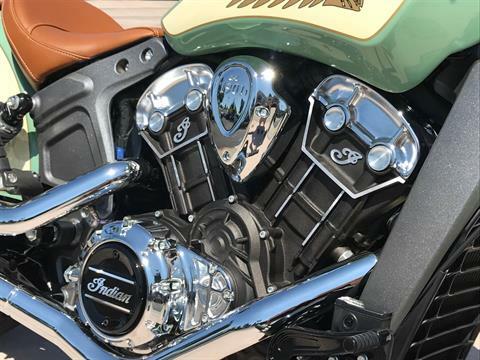 MODERN TECHNOLOGY: Today's Scout features modern technology that ensures a consistently outstanding experience: 1) Electronic fuel injection for optimum engine performance 2) Engine counter-balancing for best-in-class ride 3) A 6-speed transmission for smooth operation 4) Reliable, efficient liquid cooling. 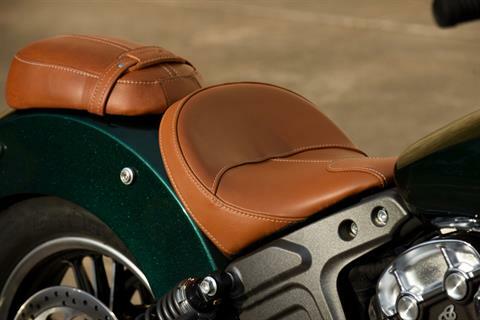 LOW SPEED HANDLING AND MANEUVERABILITY: A low center of gravity and a low seat height of 25.3 in. 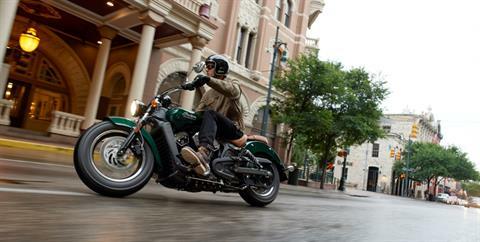 mean impressive low-speed handling and maneuverability. 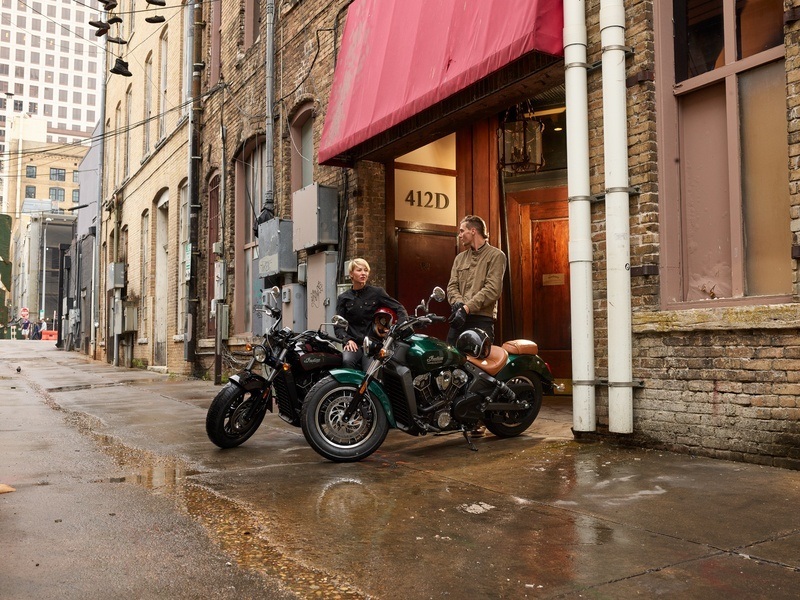 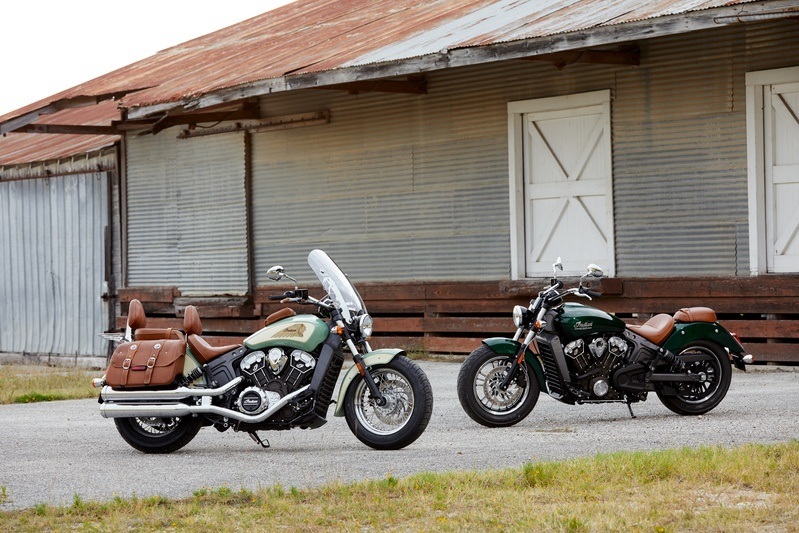 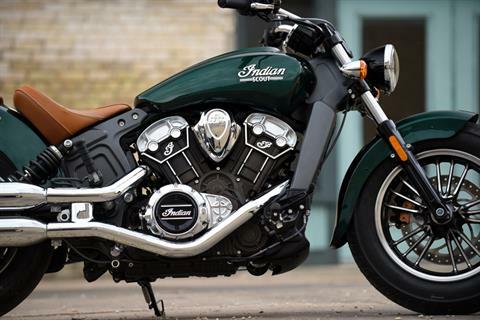 LIQUID-COOLED PERFORMANCE: The Scout was reborn for the 21st century with a modern, liquid-cooled V-Twin that opens up on the open road. 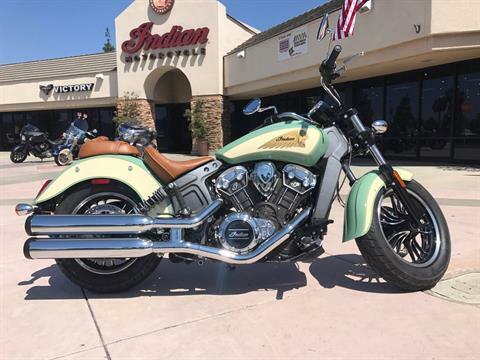 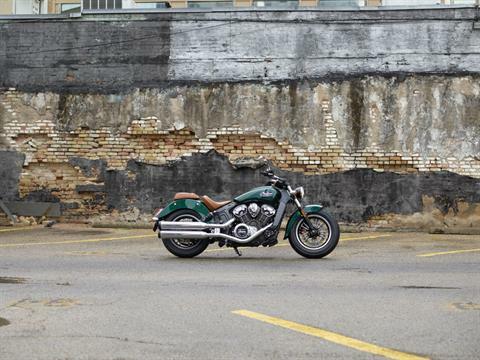 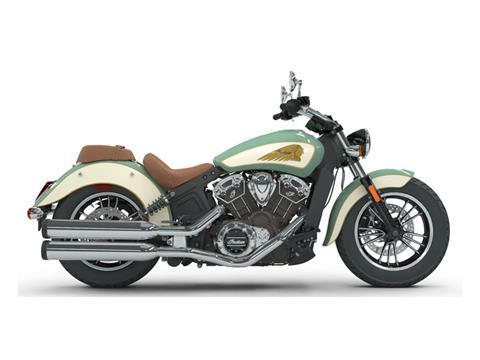 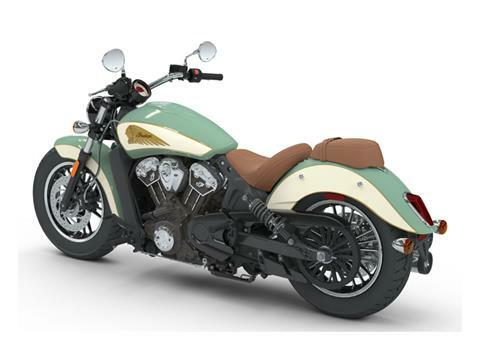 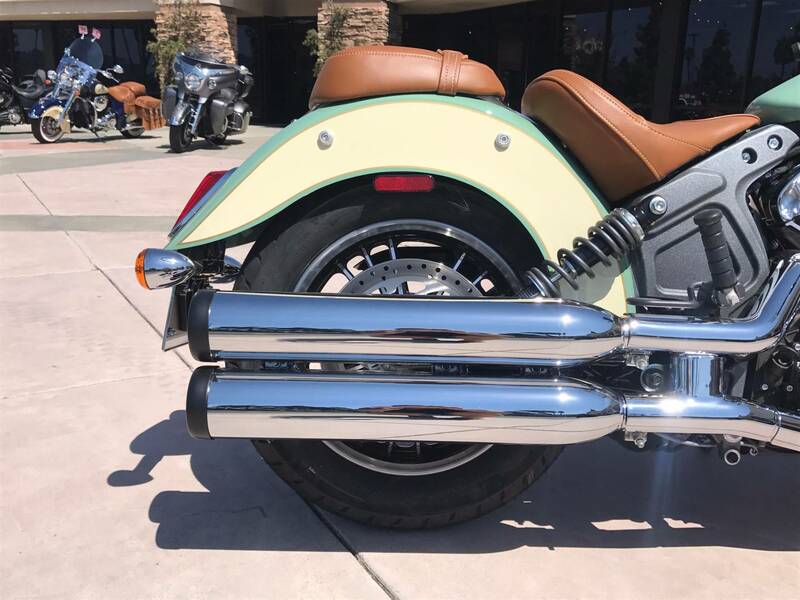 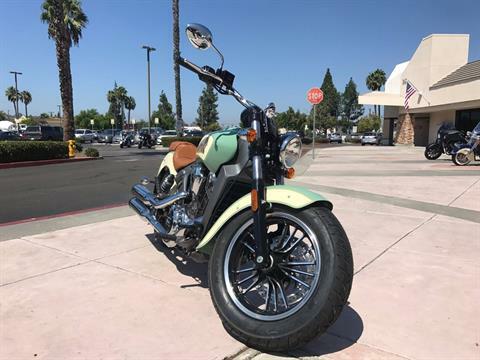 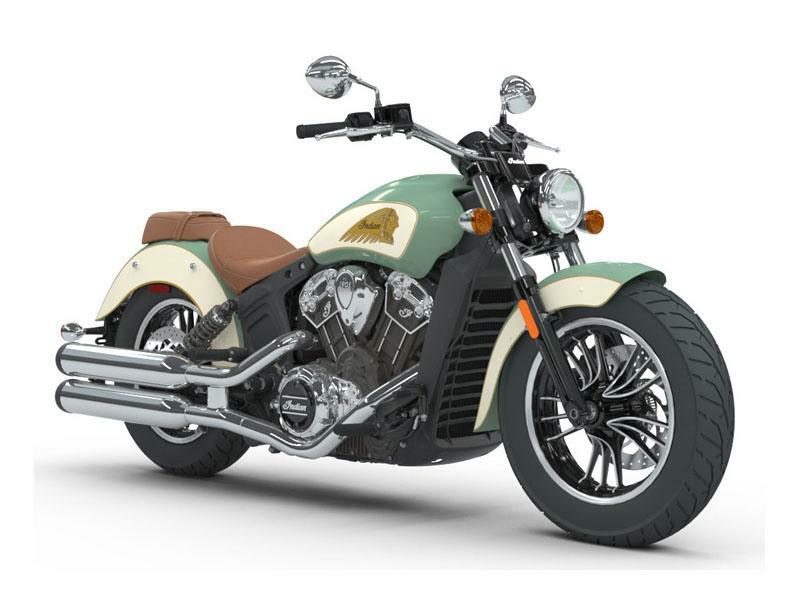 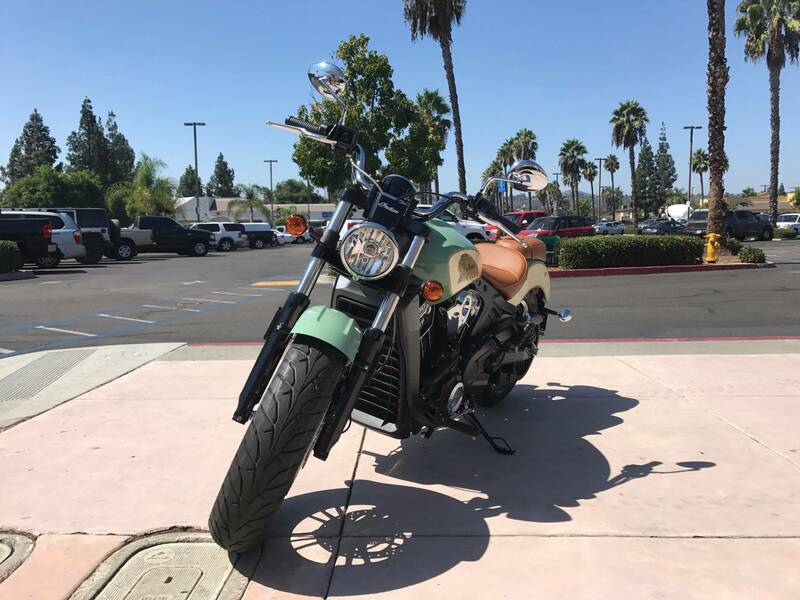 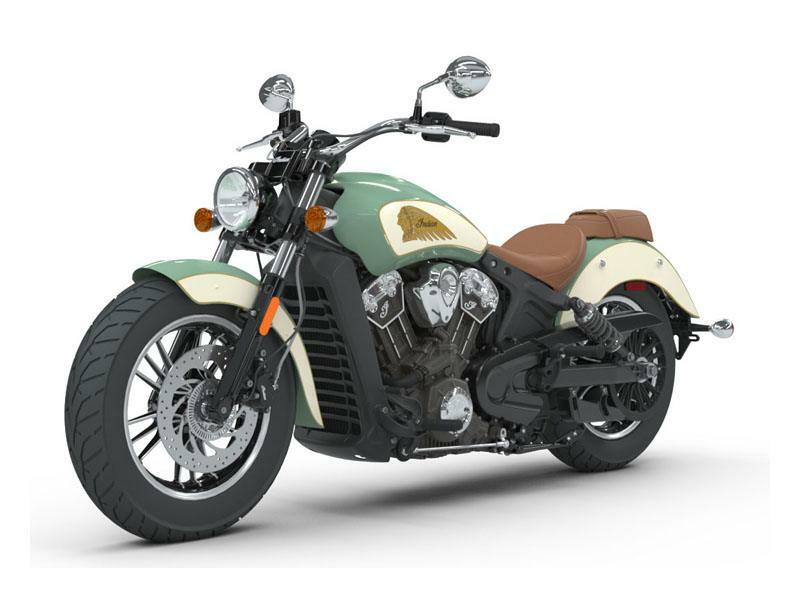 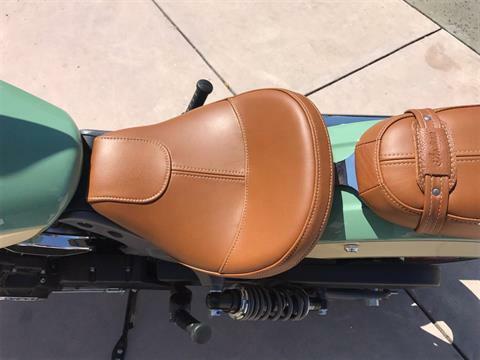 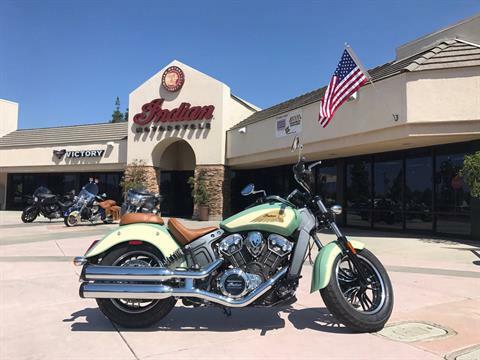 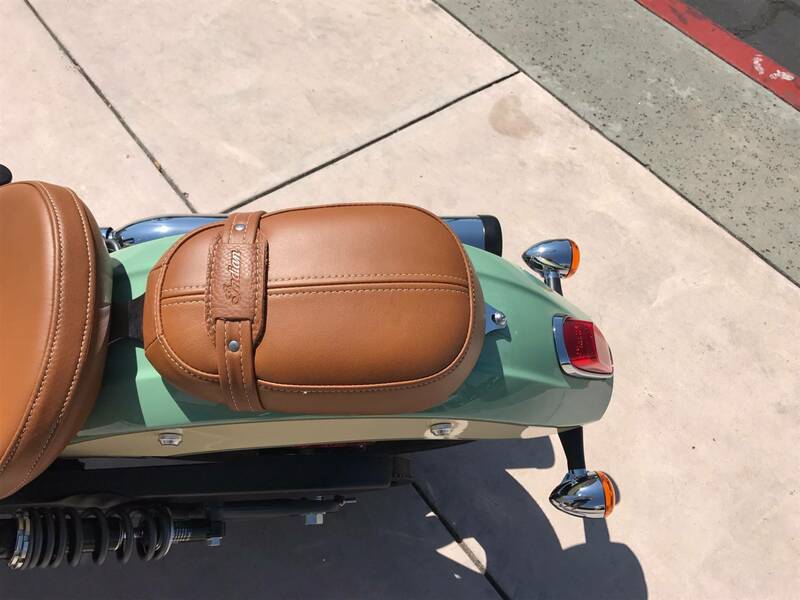 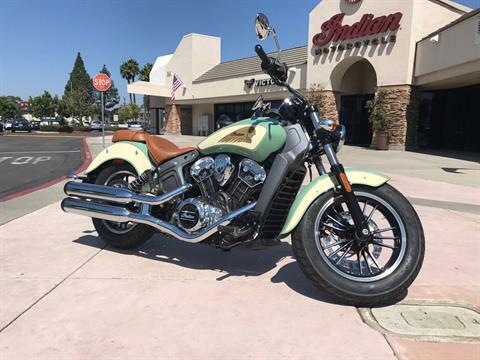 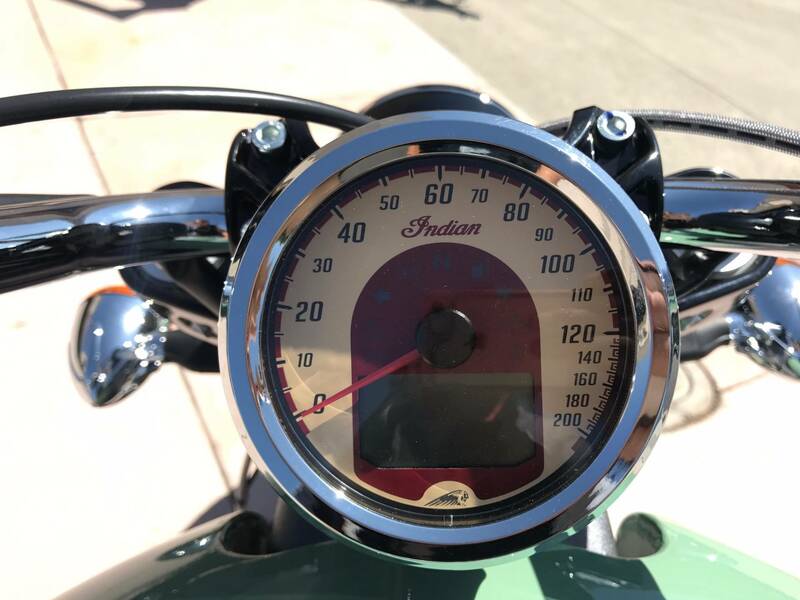 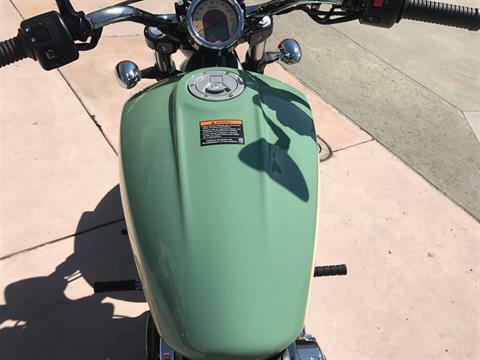 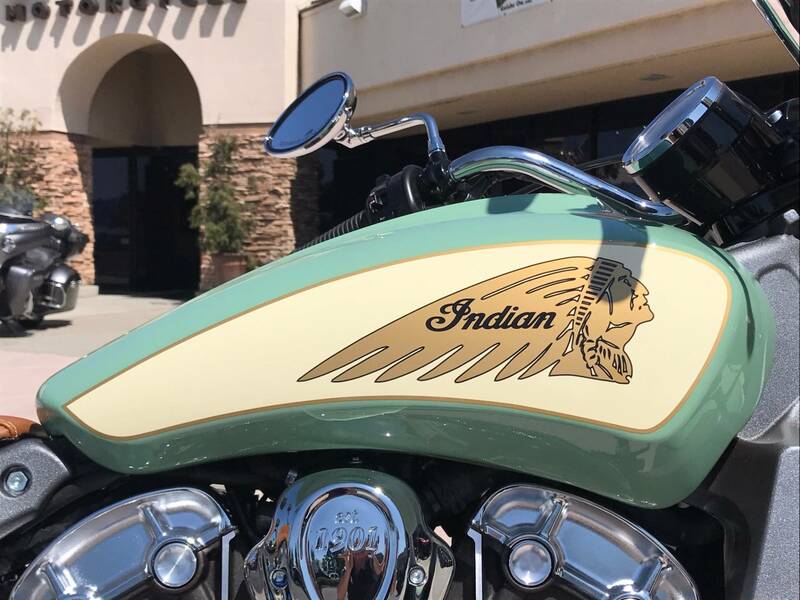 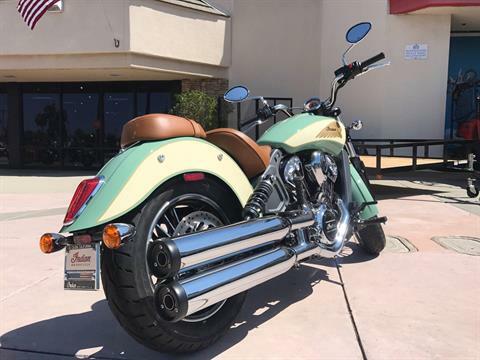 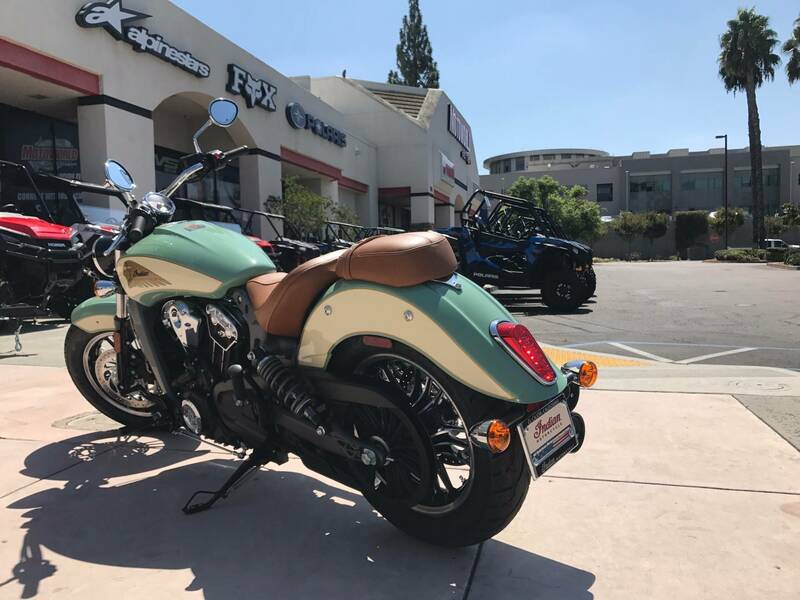 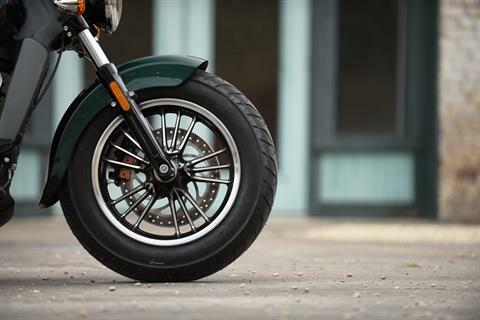 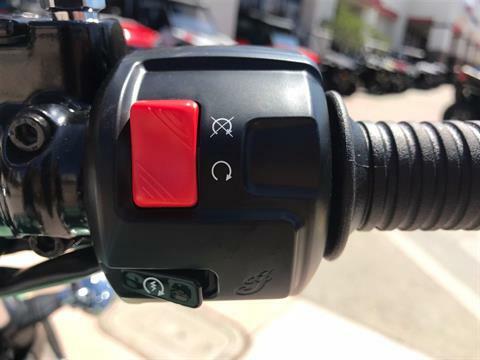 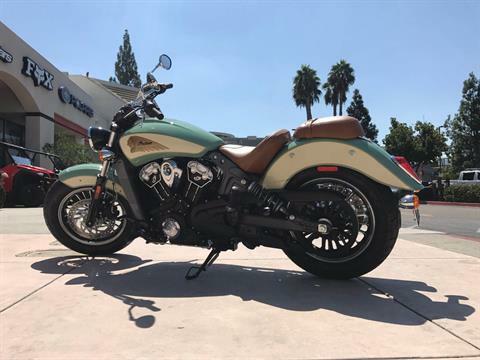 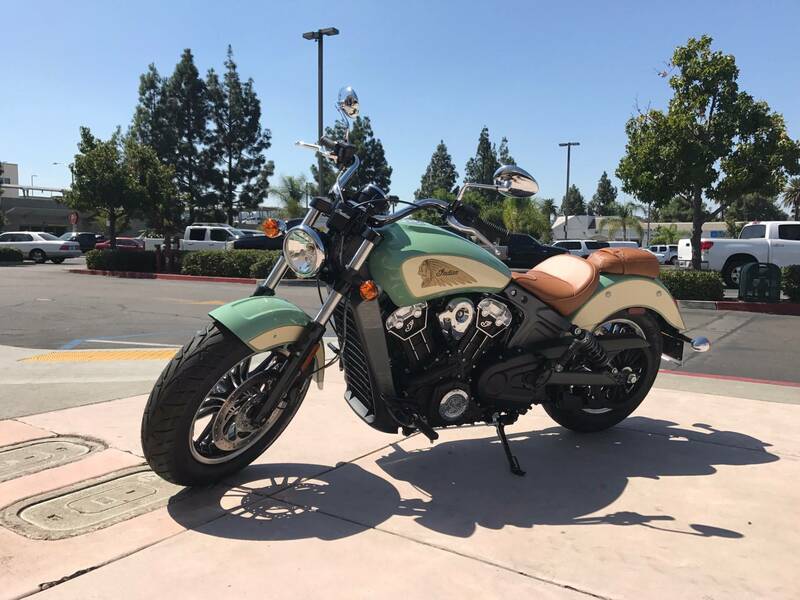 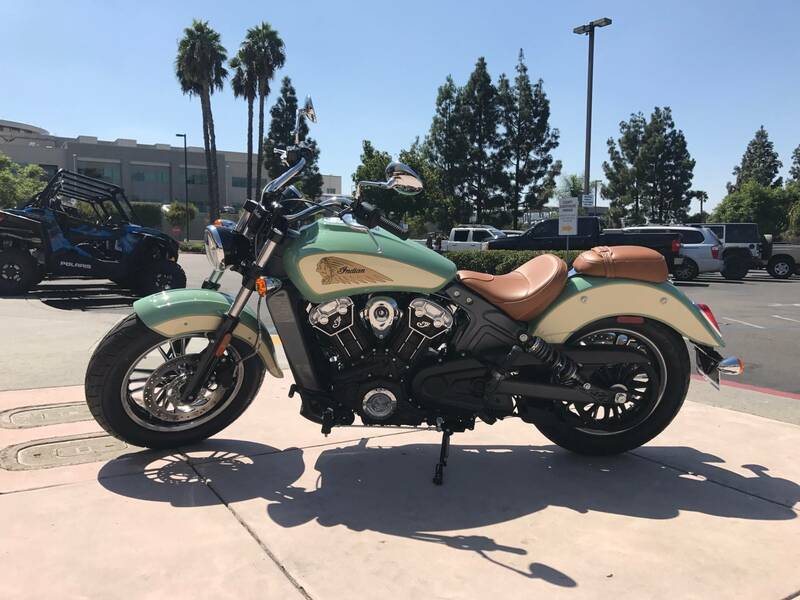 ACCESSORIES FOR THE PERFECT FIT: Combine the current Scout design with Authentic Indian Motorcycle accessories, and this bike can accommodate just about any rider, from 5 ft. - 6 ft. 4 in. GENUINE LEATHER SEATS: Styled after the original Scout, the driver and passenger seats have the ideal mix of cushion and support. And they're covered in premium Desert Tan leather that's designed to withstand the elements. 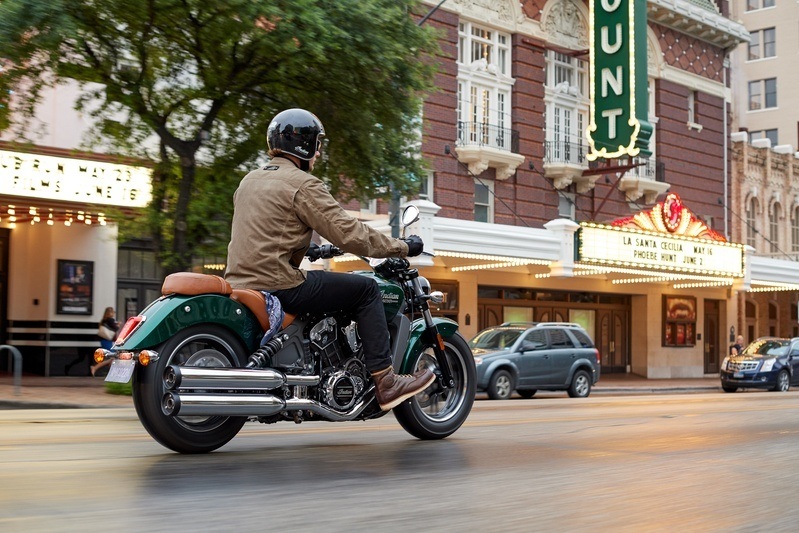 BEST-IN-CLASS HANDLING: The Scout has a confidence-inspiring lean angle that both new and experienced riders will appreciate. 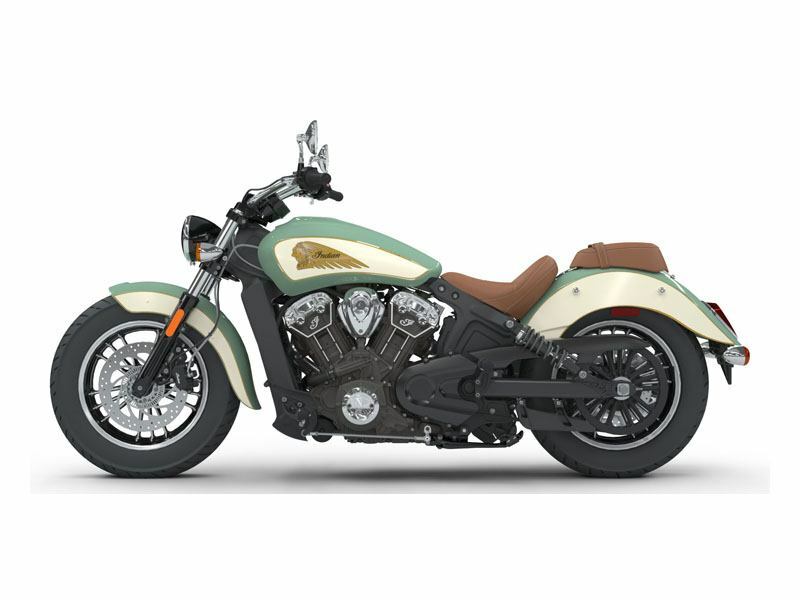 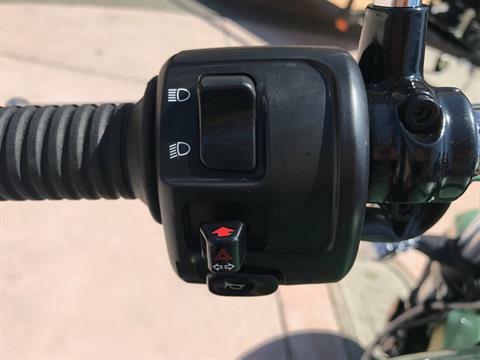 This, combined with the bikes low center of gravity, provides exceptionally high and low speed maneuverability.